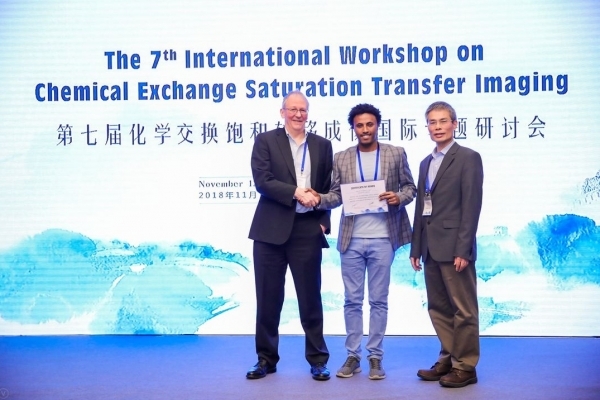 Congratulations to Gizeaddis Simegn for receiving a travel award from the 7th International Workshop on CEST Imaging held in Beijing, China, during 13-15 November 2018. Gizeaddis is PhD student in the Magnetic Resonance Imaging (MRI) Research Group in the Division of Biomedical Engineering under supervision of Dr Frances Robertson, Dr Ali Alhamud and Prof Ernesta Meintjes. The award recognises that Gizeaddis and his supervisors are the first on so far only group in Africa working on Chemical Exchange Saturation Transfer MRI. Gizeaddis' work specifically focuses on glycogen chemical exchange saturation transfer.